Wash and trim the ends off the asparagus. Blanch it in boiling water for about a minute or so to tenderize it a bit. Bring water to a boil, add the asparagus, and time it after the water comes back to the boil. 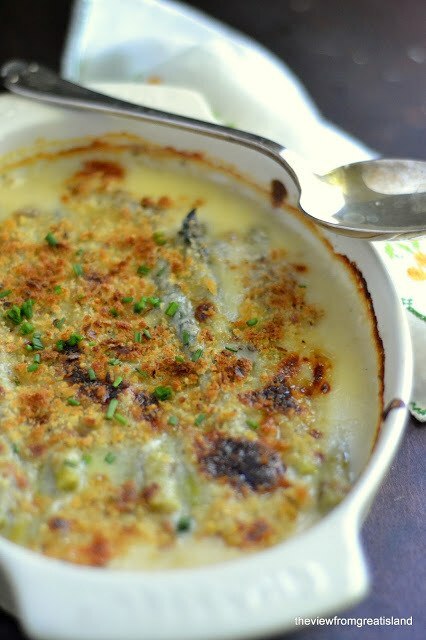 Set the asparagus in a buttered gratin or baking dish. Melt the butter in a saucepan, and whisk in the flour. Cook for just a minute, but don't let it brown. Then whisk in the milk and blend well. Add the nutmeg, salt and pepper and continue heating until the sauce thickens, stirring or whisking constantly. Take the sauce off the heat and stir in the cheese until the cheese melts and the sauce is smooth. Pour the sauce over the asparagus, and top with the bread crumbs. Bake for about 20 minutes, until browned and bubbling. Run it under the broiler at the end if you want a little more color, but watch it carefully. Sprinkle with chives or parsley, and serve hot.